Eric T. Bergman grew up in the Lost Elm-like town of Carlton, Minnesota. After graduating from the University of Minnesota-Morris, he slogged through half a dozen years as a paralegal in Minneapolis before becoming a middle school social studies teacher in western Wisconsin in the late 90’s, where he’s been ever since. In addition to writing his first novel, Eric authors a weekly blog of musings, rants and personal stories called The Cheap Seats. Within those blog posts, in poetry and prose, the seeds of the story that grew into Addie Braver were planted. Eric currently lives amicably in the Twin Cities with his cat Stella, though some days are better than others. Addie Braver is a coming of age novel for young adults written by Eric T. Bergman. Addie’s last memory of her dad was emblazoned so brightly in her memory. She was only three and a half years old, and the sights and sounds of the airport were nightmarish and terrifying. It was a strange thing for her as she was, even at this early age, a relatively fearless and self-confident child, in no small part due to the close and loving relationship she shared with her dad. He was leaving now, and she had no idea when he would be coming back; she only knew that there was no way he could not be coming back to her. He gave her the Polaroid picture that had been taken of their little family, Addie clinging fiercely to his trousers as they posed. He asked her to keep it for them, to keep it safe and not forget. Addie studied the faces in the picture as the Polaroid film worked its magic, saw the familiar smile on her dad’s face, the worry and fear etched into her mom’s. As they watched his plane take off, Addie asked her mom what Vietnam was, not realizing that she’d never see her dad again. Addie Braver follows an older, wiser Addie of fifteen who has had to grow up way too early in order to protect herself and her brother from the undisciplined and alcoholic stepfather she loathes. Her story is interwoven with letters she writes to her real dad, sharing her day, her emotions and her dreams. I loved reading about Addie and her little brother, Billy, and marveled at the way her mom sets in motion the mentorship the two fatherless kids receive at the hands of Mr. and Mrs. Carson. Seeing Lost Elm in 1977 through Addie’s eyes is an unforgettable experience as this fearless and utterly original young woman comes of age. Bergman’s book is beautifully written, his characters are vividly alive, and his plot works so very well. All in all, a debut novel of remarkable power and brilliance. 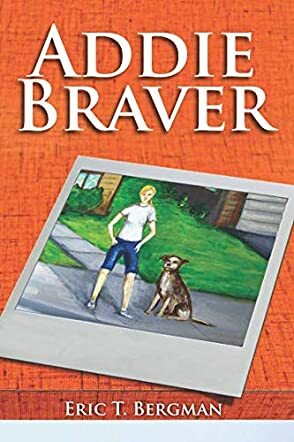 Addie Braver is most highly recommended.